I wanted to experiment a little this weekend and try out some non-flour crusts. 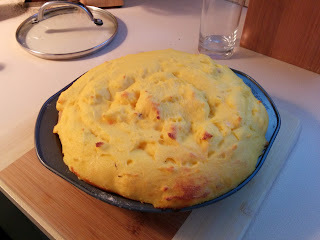 I saw a recipe that has a polenta crust on top and though that sounded pretty neat. I didn't like the sound of that filling though for this weekend and I wanted to also use a pastry crust because it'd been a while since I'd made shortcrust pastry. I decided to use that crust on top of another pie that looked delicious. Make the shortcrust pastry using the method described previously. Blind bake the pastry case while cooking the rest of the components. It'll probably have time to cool a little if you cook things as fast as I do (which is a little slow) and that's OK. Keep the oven at 200ºC for later. Heat the oil in a pan and fry the onion until soft. Add garlic and chicken and fry until chicken is browned. Add stock, rosemary, sweet potato and simmer until the potato is soft. Add flour to thicken the gravy. Remove from heat and stir in the blue cheese and cream. Boil the milk with 2 cups of water. Pour the polenta into the boiling liquid in a stream while stirring. Reduce heat to medium/low and continuously stir until the polenta is thick enough that the spoon stands in it. Take off heat and stir in the cheese and egg. Fill the case with filling, top with the polenta and bake until the polenta is browning on top. So, what went right? The flavour of the filling was quite nice. I only ended up using 2 sweet potato in the filling but even then I only needed 2/3 of the filling I cooked. 500ml of stock is way too much. It made too much gravy that thinned out the flavour of the filling too much. I even removed 1/3 of a cup of it during cooking and there was still way too much. And I left out the cream because it would have thinned it out even more. 100ml would be plenty, but probably even 50ml would be enough - just keep an eye on the liquid and make sure there's some there to soften the sweet potato. 1 cup of polenta is also way too much. 1/2 cup would have been plenty. 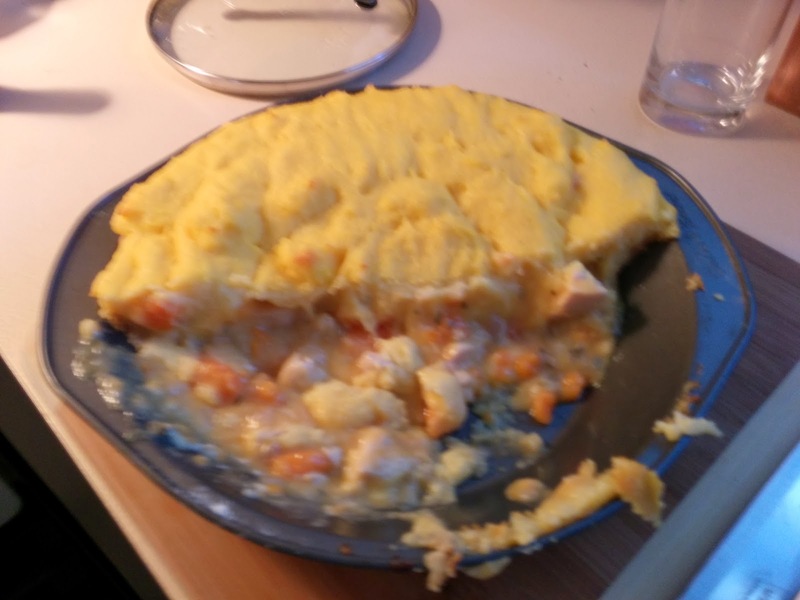 It ended up being quite a thick layer on top and there was just too much in each serving. I think I might have stopped cooking the polenta a little early too - next time I use it I'll cook it for just a little longer to see if ends up being a little less runny (it didn't run as such, but it was smooth on the top unlike in the photo from the original recipe).